This week’s where are they now is focused upon the team that won promotion from the Conference to the Football League in the 2004/05 season. There were two ways I could have gone about this – in the end I decided upon going for the starting XI with the most starts in the League campaign. Scotty, most likely to remembered for his obscure haircuts than his saves – although, I’ll always remember him as the man that bought my dad a drink before a game back when the bar was inside the ground – only lasted one and a half seasons at Underhill before moving on. Despite winning a Conference winners medal, he only made 35 appearances from the years of 2004-06, before leaving for Rushden and Diamonds. From there he went on to play for Ebbsfleet United, Northwich Victoria, Salford City and now turns out for Vauxhall Motors – back near his hometown. Damien Batt was another player to receive a Conference winners medal, despite a short stay and few appearances. After leaving the club, he went on to play for many non-league outfits including St Albans City, Woking and Fisher Athletic. He is, however, playing in the Football League at current with Oxford United, where he features regularly. The last time he came back to Underhill, he went off injured. ‘Tricky’ was one of the players most popular with fans during his time with the club, and I think it’s safe to say when he was released at the end of the 2006/07, many were sad to see him go. 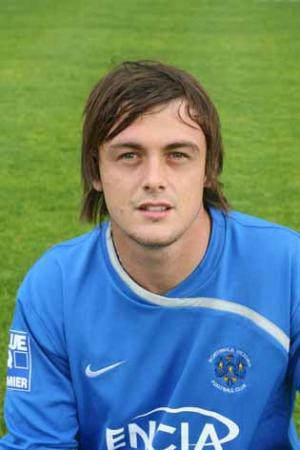 After leaving the Bees, he spent two seasons at Dagenham and Redbridge before joining fellow Essex outfit Grays Athletic. He played for non-league club Eastleigh last season, and is now a free agent. Clisty was another popular face amongst the squad during his three seasons with the Bees – like Tricky, many were sad to see him released at the end of the 2005/06 season. 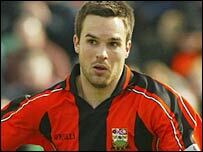 After leaving the Bees, Simon joined Forest Green Rovers, where he made over 100 appearances for the club. He left there for a fee and moved to Oxford United in 2009 where he continues to feature. ‘Super, super Ben’ was, at one point, the longest serving Bees player – racking up just under 200 appearances in his eight years with the club (minus several seasons of his early career on loan!). As well as this, he was the only to have been relegated to the Conference in 2000/01 and promoted back to the Football League in 2004/05 with Barnet. After leaving the club he joined Crawley, before playing for Dagenham and Redbridge and Brentford. He’s been playing for Wycombe Wanderers since 2010, and I think I speak for most Bees fans when I say how pleased I am for him that he managed to gain promotion to League 1 with the club. Next week’s entry will be on my All-Time Barnet XI; you can check the previous feature out here.